As always, the meeting reflected the cooperation of the entire geochemical community. 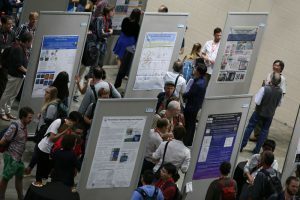 Hundreds of scientists contributed to the success of the conference by volunteering as theme and session chairs, grant application reviewers, mentors, and student helpers. Figure 2. Pu Yue (Northeastern University, USA) discussed his poster on Monday. The Local Organizing Committee was chaired by Shuhei Ono (Massachusetts Institute of Technology, USA) and Steve Parman (Brown University, USA) and ensured that attendees had the opportunity to experience the beautiful city of Boston during the week. The Local Organizing Committee also coordinated field trips, workshops, and a new program for local kindergarten-through-12th-grade educators. Other members of the committee included Ethan Baxter (Boston College, USA), Dawn Cardace (University of Rhode Island, USA), Meredith Hastings (Brown University, USA), Katherine Kelley (University of Rhode Island, USA), and Andrew Kurtz (Boston University, USA). Figure 3. The student helper team is integral to making the conference run smoothly: they assist delegates with registration, uploading their talks, and so much more. The Science Committee was chaired by Tim Lyons (University of California, Riverside, USA) and Daniela Rubatto (University of Bern, Switzerland) and also included Hagit Affek (Hebrew University of Jerusalem, Israel), Fang Huang (University of Science and Technology of China), Ann Pearson (Harvard University, USA), Graham Pearson (University of Alberta, Canada), Roberta Rudnick (University of California, Santa Barbara, USA), Cara Santelli (University of Minnesota, USA), and Maria Schönbächler (ETH Zürich, Switzerland). Figure 4. 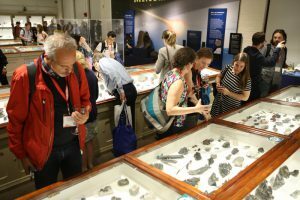 On Tuesday evening, attendees enjoyed the collection on display at the Harvard Mineralogical and Geological Museum. The museum hosted a mixer for Goldschmidt participants. The meeting was organized into 14 themes for which 3,076 abstracts were received. The Science Committee, theme chairs, and session leads did an outstanding job reviewing and organizing the abstracts into a coherent and well-organized program, with 1,761 oral presentations and 1,315 posters. Delegates came from all over the world: the 20 countries with the largest number of participants were: the United States, China, Germany, the United Kingdom, Canada, Japan, France, Australia, Switzerland, Korea, India, the Netherlands, Israel, Brazil, Belgium, Denmark, Poland, Spain, Italy, and Chile. Figure 5. Delegates applaud Prof. Sara Seager’s talk on the search for habitable worlds. 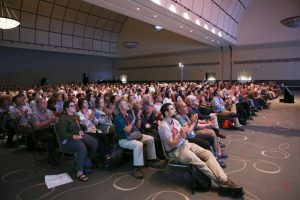 The daily plenary talks featured fascinating topics that ranged from the deep ocean to the distant stars. Prof. Sara Seager (Massachusetts Institute of Technology, USA) presented, “Mapping the Nearest Stars for Habitable Worlds” on Monday. 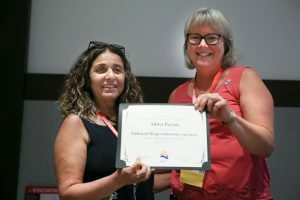 The 2018 Paul Gast Lecture, “Oxygen Loss in Coastal Waters: Impact on Geochemical Cycles,” was delivered on Tuesday by Prof. Dr. Caroline Slomp (Utrecht University, Netherlands). On Wednesday, Prof. Tuba Özkan-Haller (Oregon State University, USA) gave her talk, “Transforming Academia: Advancing Diversity, Inclusion, and Social Justice in the Geosciences.” On Thursday, Prof. Fumio Inagaki (Japan Agency for Marine–Earth Science and Technology, Japan) presented “Exploring Deep Microbial Life in the Planetary Interior: What Are the Limits of Habitability?” Then on Friday, EAG President Bernard Marty (Centre de Recherches Pétrographiques et Géochimiques in Nancy, Centre nationale de la recherche scientifique and Université de Lorraine, France) delivered “Origin and Early Evolution of Terrestrial Volatiles.” All five plenary lectures can be viewed online at www.youtube.com/user/goldschmidtconf. Those who attended the Wednesday morning sessions got an unexpected break when the convention center’s fire alarm sent everyone outside. Fortunately, there was no fire and the conference resumed quickly. One good thing came of the alarm: the convention center gave the GS a discount on Wednesday morning’s coffee break to apologize for the disruption. The GS has decided to use the savings to fund 15 student grants at a future Goldschmidt Conference. Figure 6. 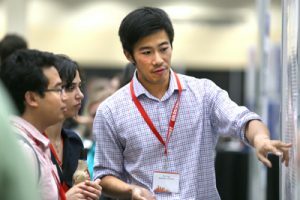 One of the conference’s most popular components, the afternoon poster sessions provided dedicated time for delegates to discuss their science. About a year ago, the GS and EAG began discussions on how to make the Goldschmidt Conference a more inclusive conference for everyone who attends. The GS Ethics Committee led the effort to write a code of conduct, which was put into place at this year’s meeting. To support implementation of this code, the societies trained a group of volunteers to serve as points of contact for any delegate who had questions or experienced harassment during the conference. This initiative was named AMIGo, short for A More Inclusive Goldschmidt. The Local Organizing Committee also made diversity and inclusion a focus of the conference. Wednesday’s plenary was devoted to this topic, and a workshop addressed the issue of sexual harassment in the workplace. The 2018 conference offered a significantly larger number of grants this year thanks to support from several sources. The U.S. National Science Foundation provided a grant that funded students who identify as members of underrepresented groups in science and engineering or who attend underrepresented institutions in the USA, such as small universities and colleges. The GS provided matching funds for this group. The National Aeronautics and Space Administration (NASA) provided grants for students and post-docs working in planetary geology, cosmochemistry, and astrobiology. The GS and Elsevier also provided grants for students and early career scientists from low-income or lower-to-middle-income economies, as defined by the World Bank. In total, 70 delegates received grants to help them attend the conference. A number of workshops that were held before and during the conference offered in-depth looks at scientific and career strategy topics. Several were presented at Boston University, which also provided housing for more than 300 delegates during the week. The Local Organizing Committee planned three field trips, all of which sold out. Participants visited areas around the states of Massachusetts and New Hampshire to learn about New England’s regional geologic history, and some took a whale-watching cruise off Cape Cod (Massachusetts). The incredible science presented during the 28th V.M. Goldschmidt Conference has implications that stretch far beyond the meeting itself. Press officer Tom Parkhill and the media team distributed eight press releases throughout the week to promote both the conference and geochemistry to a wide audience. The releases generated significant media attention, with articles and interviews appearing in publications such as Newsweek, The Independent, BBC Radio, Die Welt, Scientific American, and many more. All of the press releases can be found at goldschmidt.info/2018/pressReleasesView. 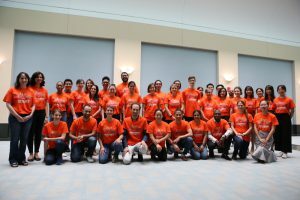 The Local Organizing Committee and the Science Committee organized a special thematic session, “Communicating Science: Outreach and Education,” which examined challenges that scientists and educators face when trying to teach geochemistry topics to students and the general public. The session included traditional oral presentations and posters, as well as talks from invited experts in Earth-science education. Participants learned strategies for translating complicated topics into age- and expertise-appropriate content for audiences, including elementary schools, university students, policy makers, and the general public. A successful Goldschmidt would not be possible without the support of generous sponsors. The GS and the Local Organizing Committee wish to thank Thermo Fisher Scientific, Curtin University, and the Geochemist’s Workbench for their support of the 2018 conference. The Gordon and Betty Moore Foundation, ACS [American Chemical Society] Earth and Space Chemistry, American Geophysical Union, Elementa: Science of the Anthropocene, and the Geological Society of America who supported the student program. Finally, our warmest thanks go to the many exhibitors who shared their expertise with delegates throughout the week.